Through the continued Starwood Hotels and Resorts partnership with the Mercedes AMG Petronas F1 Team, Lewis Hamilton recently filmed a new short film at the Sheraton Park Lane Hotel in London to showcase Starwood Preferred Guest (SPG) membership. As Lewis and the team prepare for the final race of the year in Abu Dhabi, Starwood Hotels and Resorts have shared behind the scenes images taken during the filming where we see Lewis, fresh from filming his Zoolander 2 cameo, is keen to get behind the camera. Starwood Hotels and Resorts choosing Lewis Hamilton and the Mercedes AMG Petronas F1 team as ambassadors for SPG membership further demonstrates the value of F1 engagement and the sports audience reach. It also goes to show a Formula One drivers job extends far beyond requirements at the track. To see more from #TravelLikeLewis you can follow SPG on twitter by clicking here. Lewis Hamilton took on a rival of a different kind yesterday, swapping the tarmac for the canvas of a wrestling ring. The newly crowned Formula One World Champion appeared at the Arena Mexico to face an opponent laced in grease and leather at the spiritual home of Lucha Libre. Lewis showed his talents that extend beyond the steering wheel as he took on the wrestling star at a PUMA event in the Mexican capital. With Formula One returning to Mexico after a 23-year absence, PUMA gave Lewis a cultural insight into the passions of Mexico – embracing the four values of Brave, Confident, Determined and Joyful. A rousing rendition of Mariachi music fronted by the lovely Latina actress Zuria Vega got things underway, with a fussball fiesta following against the Mexican star striker Oribe Peralta. The event concluded with a spectacular finale, headlined by a wrestling extravaganza against the might of Mistico. Speaking about his Mexican experience, Lewis said: “I never saw myself in the wrestling ring but after taking on Mistico last night I think I’ve found a new talent! I always enjoy getting an insight into the culture of race countries and last night was a brilliant experience. Seeing the spirit of the Mexican people and how they embrace their values of joy, confidence, bravery and determination was very inspiring. The enthusiasm, passion and excitement for the return of Formula One to Mexico was clear and it was an honour to share the stage with some of the country’s stars to celebrate this. 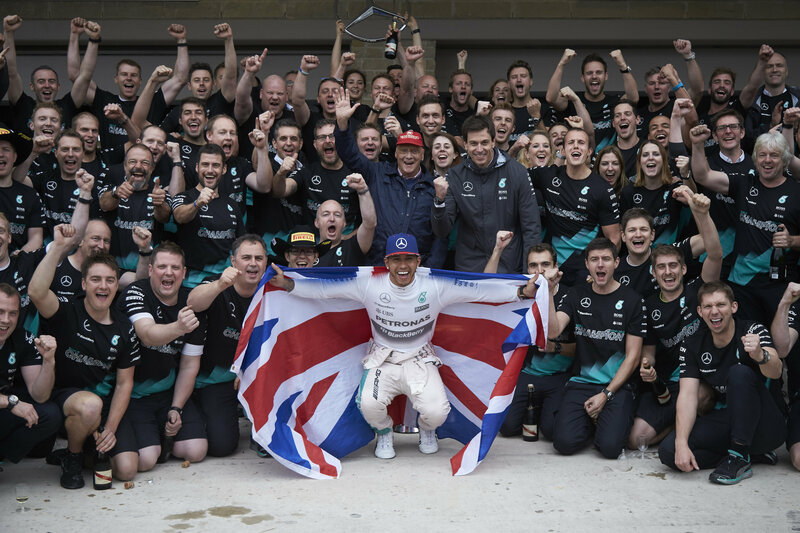 Formula One: Austin – Lewis Hamilton 3 times World Champion! It’s an overwhelming moment. Remembering my first British Championship, when my dad and me drove home singing ‘We Are the Champions’. Thinking about how much my family sacrificed – my Mum, my Dad, my whole family. And also thinking about my fans. They give me so much energy and I hope I inspire them to never give up on their hopes and dreams. The race today was really amazing and anything could have happened. The last 10 – 15 laps were extraordinary – it was just a crazy, crazy race. I was in the lead, then I was fourth and the conditions were really tricky. Nico was driving really well, too. All the way through, I was thinking; “The Championship is there somewhere… how can I get it?” It was so close I could smell it and there was never a moment I didn’t believe I could do it. It’s just incredible to equal Ayrton, too. My target was always three titles as he was the one who inspired me. There is no one I want to equal now – I just want to carry on as far and long as I can. For any driver, you want to win in anything you compete in – but this is the ultimate goal. Championships mean greatness – yours and your team’s! This Team has been so amazing. I feel incredibly thankful. I thought I would win with this team, so that’s why I moved… and I did! First of all, a huge congratulations to Lewis. He has driven like a Champion all season and now rightly takes his place in a special group with a third title. I have no doubt there is more to come from him, so if we can keep delivering a car that is capable of doing the job then anything is possible for him. For Nico is has been an unlucky year in many ways. But he has shown his fighting spirit once again today and that will not change in the seasons to come. Looking back at today, we saw a fantastic race from start to finish and I hope that everybody watching was as entertained as we were – particularly the people in the grandstands who braved the weather this weekend. On the pit wall it was a very difficult race to manage, with so many decisions to make and so many marginal calls with the safety cars. We tried to play it fair and square as we always have done and perhaps not every call was the right one. But in the end Lewis had the World Champion’s luck on his side and when you drive the way he has done this season you earn that luck. The first corner was certainly a tense moment and Nico was clearly not happy. It’s never going to happen that a driver is completely happy to see a rival winning. But we have three races left and it’s crucial that we don’t allow today’s incident to have further consequences. We will go away, have a few days of cooling off, and then talk. Looking ahead, we have three races still to go. I have never been in that situation where everything is comfortable and I can sit back and enjoy the race as a fan, so I’m looking forward to seeing our two drivers fight flat out with nothing to lose. What a day! Massive congratulations first and foremost to Lewis. A third World Championship is a great credit to all the hard work he has put in not only this season but over a fantastic Formula One career to date. It is very much deserved and I think he can rightly stake his claim as a legend of the sport. At the same time, all credit to Nico today. He’s had a tough season in terms of luck but has kept pushing throughout. He drove superbly today and, bar one small mistake which handed Lewis the lead, would surely have won the race. It’s been an emotional day – not just for Lewis and the team but also for the sport. We saw a truly incredible race – one of the most exciting for many years – which atoned for what had been a pretty grim weekend. The fans here in Austin have been fantastic despite the conditions and very much deserved the entertainment we saw today as a reward for their dedication.